Forty years after the first concert, Signature Symphony at Tulsa Community College recreates the debut program, “Bach and Sons, Inc.,” performed by the Tulsa Little Symphony in 1979. Tulsa Little Symphony would later become TCC’s orchestra-in-residence, Signature Symphony. “Bach and Sons, Inc.,” is at 7:30 p.m., Saturday, January 26, 2019 at the VanTrease Performing Arts Center for Education on the TCC Southeast Campus. The evening celebrates four decades of presenting live music and entertaining Tulsa area audiences with music from the extended Bach family with a twist of humor. The program features Carl Philipp Emanuel Bach’s Symphony in C major and Johann Sebastian Bach’s Overture No. 3 in D major. Harpsichordist Brady McElligott will join Signature Symphony musicians Maureen O’Boyle and Dana Higbee in Johann Sebastian Bach’s Brandenburg Concerto No. 5. The Signature Chorale will be featured in J.S. Bach’s Magnificat and The Seasonings by P.D.Q. Bach, a fictitious composer invented by musical satirist “Professor” Peter Schickele. “Bach and Sons, Inc.” is part of a year-long celebration highlighting audience favorites and returning guest artists from the professional orchestra’s history. The rest of the 2018-2019 season includes fan favorites such as Signature Big Band, Mahler’s Symphony No. 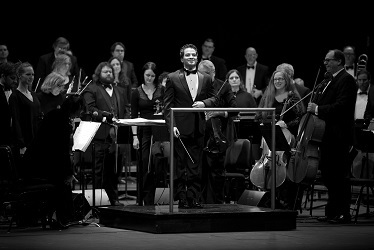 2 “Resurrection” as part of a multi-year Mahler Project, and “Tulsa Sings! II: The Bernstein/Robbins Centennial,” featuring Broadway’s Scott Coulter and other top vocalists. Since its formation in 1979, the Signature Symphony at TCC has been committed to providing rich musical experiences through live performances, as well as music education and community outreach. Before every Classics concert, our Open Rehearsals allow music lovers of all ages to experience professional orchestra rehearsals and enjoy educational interactions with our conductor, musicians and guest artists. The Open Rehearsals are free and begin at 6:30 p.m. on Jan. 24, 2019; March 14, 2019; April 18, 2019. For the remainder of 2018-2019 season, Signature Symphony at TCC is offering a Flex Season Package with your choice of concerts from the remaining Signature Classics and TTCU Pops series. The Flex Season Package still offers a substantial savings over purchasing individual tickets. Purchase tickets online or call 918-595-7777.